Above: While driving back home from El Paso through Columbus, New Mexico, Jeff Grooms captured this standout entry for our 2018 photo contest. Photography by Jeff Grooms. The unglamorous, squeaking windmill … was the one machine without which the Plains settlers could not have hoped for survival. 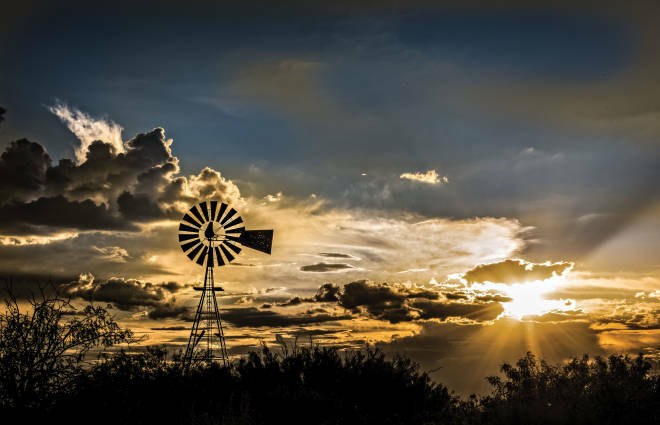 For the one essential the plainsmen didn’t have was water; the windmill often was the easiest and sometimes was the only way that the precious water could be obtained. Now the windmills are disappearing from the scene—gradually, but surely. … As long as their dwindling numbers stand, the sturdy old powerhouses of the Plains remain as evidence enough that it was not flying lead but the flying wheels of the windmills that did the most to truly win the West.